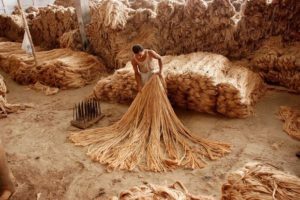 Jute is literally one of the most important natural fibers and second only to cotton with regards to production and usage. It can be used to manufacture environmental shopping bags. It is a long, soft, shiny bast fiber, which comes from the skin of the plant. Jute is a ligno-cellulosic fiber. It consists of the primary plant components cellulose i.e. plant fiber and lignin i.e. wood fiber. Tossa jute (scientific name: Corchorus olitorius). Jute (known as ‘Shada Pat’ in Bengali language) has been produced in eastern India for more than four centuries. It has literally been an integral part of the culture in this region of India. This region cultivates up to 85% to the world jute cultivation. As a result most of the premier jute bags manufacturers and jute bags suppliers are located in the West Bengal region of India & Bangladesh. Rich and fertile alluvium soil along with warm and moist climate are ideal for the cultivation of jute. Monsoon climatic condition is perfect for its production. Jute is a monsoon season crop. Its sowing starts from March to May depending on the rainfall and land type and lasts till June. Farmers usually use compost or firm yard manure for fertilizer. Small amounts of fertilizer or pesticides are required compared to the huge inputs needed for cotton production. Jute cultivation provides employment to many people as it is extremely labour intensive. This crop is harvested from July to September depending upon whether the sowings were done early or late. Early harvesting i.e. right before the plant produces seed, gives rise to good and healthy fibers. As the plants reach 2.5 to 3.5 meter in height they are cut off close to the ground by farmers using sickles. The stalks are then tied into bundles and put in water at least at 60 to 100 cm depth for about 20 days of the retting process before being sent for manufacturing purposes.